I didn't ride to church Sunday due to some confusion over coffee hour (like, I forgot to remind the people I'd assigned and wasn't sure they'd do it) and wanting to get back by 1:00 for sure to see CBS's excellent weekly Tour de France show. After the sweltering stick-your-shirt-to-your-back heat of the church (especially for me, since I was up in the mostly disused balcony to take some photos on my Mamiya 6), we lay in the air-conditioned comfort of our bedroom and watched Lance's seventh win. He is an animal. CBS does a good job with this show, done in conjunction with Outdoor Life Network, and the Trek commercials with Phil Liggett and Bob Roll are weirdly cheesy, as bad as locally-produced late-night used car dealer ads. Once that was over, I fell asleep while some golf broadcast from Milwaukee droned on. I woke up eventually, I made afternoon tea, and after that decided to go for a ride. It was cloudy to the west and the radar looked like it might portend rain, but I figured, hey, the Atlantis has fenders and some raingear, I'll just do a short ride. I headed off down Como past the State Fair Grounds with no real goal in mind, figuring it would start to rain and I'd go home. I was riding down Como when I came to the north end of the Intercampus Transitway. I'd noticed this on the excellent Twin Cities Bike Map and thought how exceedingly useful it looked, too bad it was for buses only. Still, how many buses could there be at 6:30 on a summer Sunday evening? Disregarding the Authorized Vehicles Only signs, and with a furtive look around, I headed off up the Transitway. This is the Google map satellite view of the State Fairgrounds end of the Transitway. 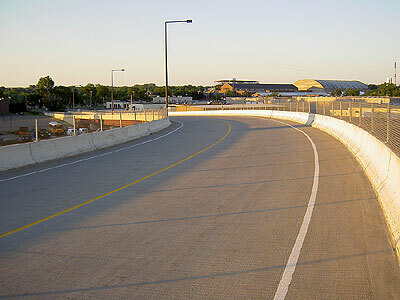 It is the bridge that curves over the railroad tracks: Google Map View of Transitway. I'm smitten! What a great route! 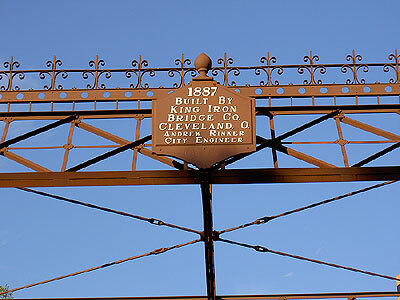 It goes up over this bridge, along some rail lines, then over Raymond and on under Highway 280. Not only that, a couple of other cyclists went by the other way looking not at all guilty. 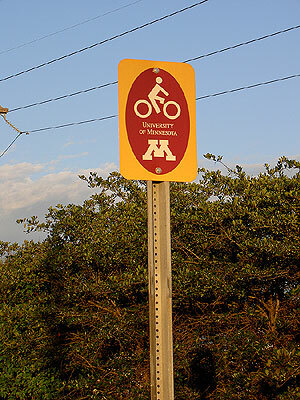 When I got to Energy Park Drive, I found out why; it's marked as a Bike Route with a University of Minnesota sign. South of Energy Park, there's a separate bike path. It's along here you go under Highway 280. At Westgate the path switches sides of the road. 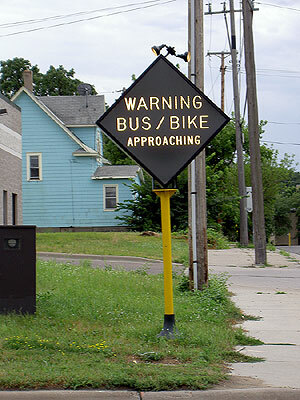 After a rash of truck/bus accidents in the mid-1990s, special signs were put in for the intersecting roads. These detect oncoming buses and bikes and light up to warn crossing drivers. 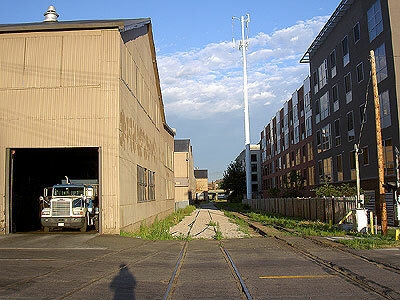 It's a pretty industrial part of town. There wasn't much traffic, but it was the evening of a sweaty night with the sky threatening rain. At the west end, it parallels University Avenue and you could get off on any number of side streets. I rode down to the Williams and Mariucci Arena end and turned left. A couple of blocks down I turned onto Washington, which has a bridge across the river. Washington's pretty busy and it's Orientation time now so there are lots of confused buffalo wandering around turning right out of the left turn lanes, looking for landmarks, saying to the kids "Boy this sure has changed since I was here when I met your Mom at that kegger" while the cool 18-year-olds roll their eyes and turn up their iPods, etc. The Washington bridge is great. 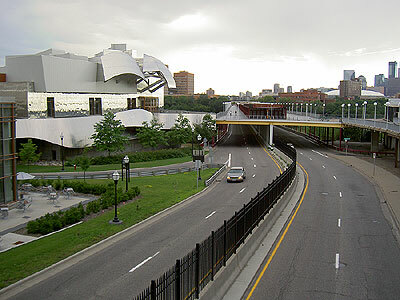 It has the road below and a path for pedestrians and bikes up above. The bike lanes are clearly marked. By the Weismann museum on the east bank there is bike parking and something I hadn't seen before. 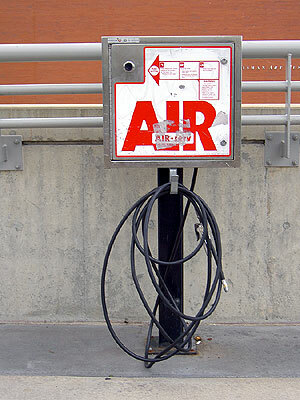 A free air pump for bicycles! Pity the fool who has Presta valves, though. I rode onto the bridge, once again Thumbing My Nose At The Man by riding on the walking side so I could see the downstream view. I didn't seem to inconvenience the single pedestrian I met, a young lady blathering away on her cellphone. 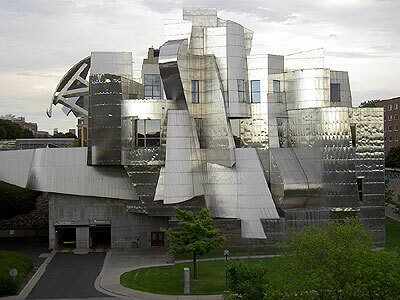 You can see the Weisman, covered in tinfoil or something. 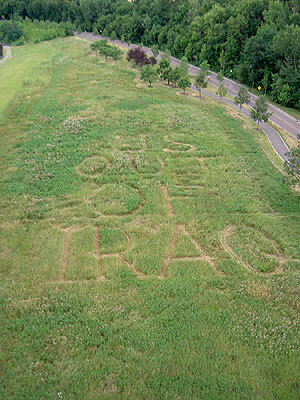 There seems to be some sentiment against the war in Iraq. Once, in Des Moines, back in the Viet Nam war, some protesters fertilized a Peace sign into a public lawn, at the Art Center, I think. That was clever as it persists for a looong time! Kind of like the war in Iraq. 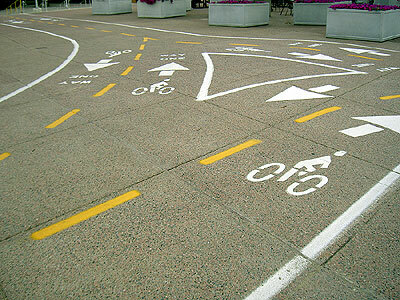 It was quiet this Sunday evening, but there are clear cycling pathways laid out when you arrive at the West Bank. I'll bet this place is hopping on, say, a Tuesday morning in September, once everyone's back, class is in session, and people have their routes figured out. I rode over to the Riverside LRT station, then up the path to downtown. The apartments right here are heavily North African. There's a tennis court hard by the Interstate and bike trail, but it's disused, lots of weeds and no net. I wonder if Somalis and Ethiopians don't play tennis. Mixed doubles might be hard with those burkhas. Riding by the Metrodome there was some outdoor concert going on. The band seemed to subscribe to the "If you have no talent, buy bigger amps" theory of performance. 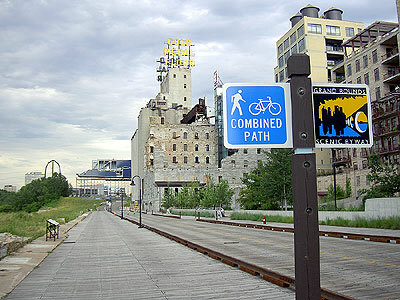 I took a photo of the path along by the Mill City Museum. 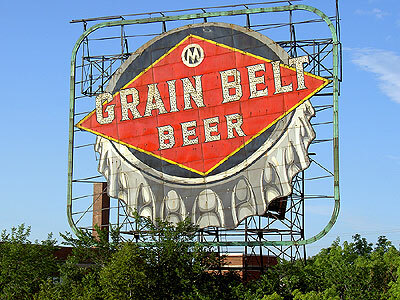 It's part of Minneapolis's Grand Round Tour. There's lots of old ruins here. 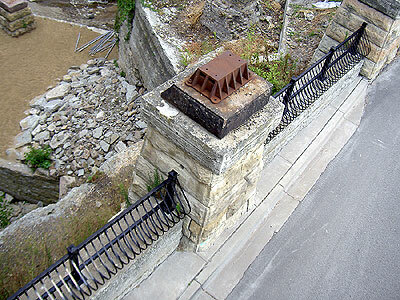 Out on the Stone Arch Bridge you get a good view of the Museum. 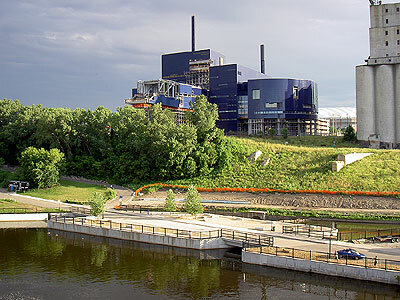 And of the Guthrie Theatre, currently under construction. The edge of the clouds passed overhead and the sun came out. I took a picture downriver. 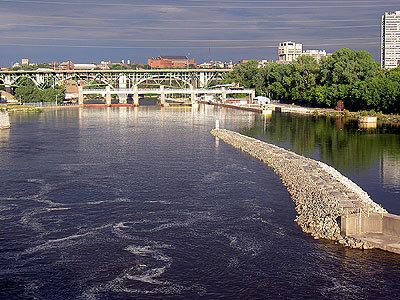 That's the lower Saint Anthony lock and dam down there along with the Interstate 35W bridge and some other structures. 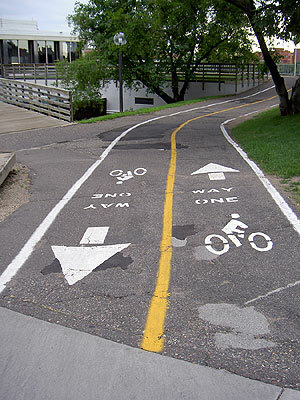 I rode up the bike path and up the spiral ramp onto the Hennepin Bridge. 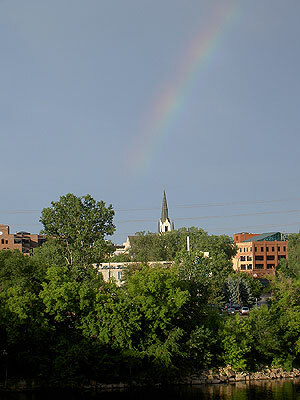 With the sun out and some trace of rain, a faint rainbow had come out. 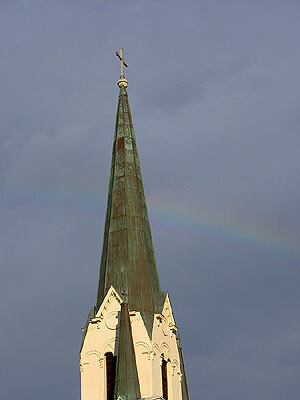 Here is it over Our Lady of Lourdes church. Right by the church, you could see it by the steeple. 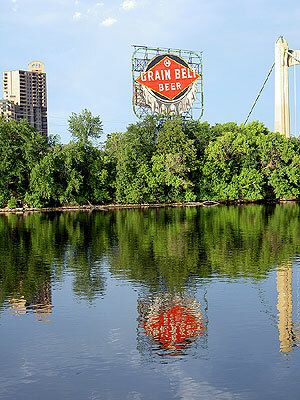 I rode back across the bridge, and took a couple of photos of the big Grain Belt sign on Nicollet Island. Oddly enough, this is right by De La Salle, a Catholic high school. I rode back down through Old Saint Anthony. 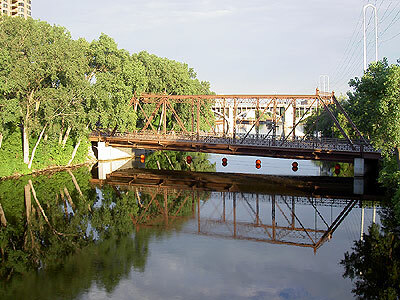 You can get to Nicollet Island a couple of ways, including this bridge. It remains as a monument to the great Andrew Rinker, whose name shall go down in History! 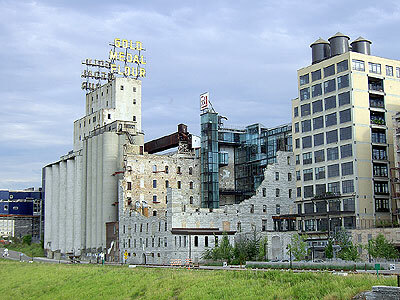 I clattered on down the cobblestones past the Pillsbury A Mill, soon to be condos. There is a funny mix of fashionable riverside residential living and actual productive industry down here. 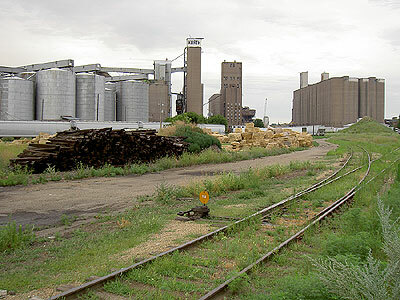 In this photo you have Metalmatic, a factory, on the left, and the Stone Arch condos on the right, with a rail spur in between. My guess is that the condos on this side are cheaper than the ones overlooking the river! 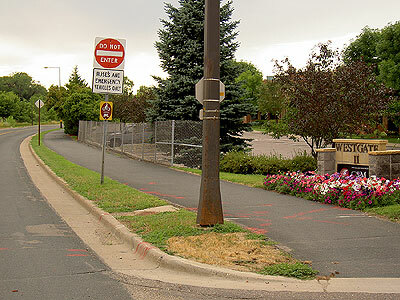 I rode up through Dinkytown and back out to the acres of parking lots around the beginning of the bike path. 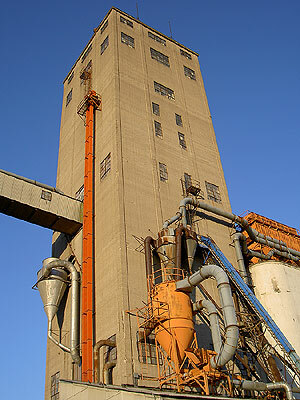 There are a number of old but still-active grain elevators out here. Here is some of the machinery in the late evening light. I got back on the Transitway bike path and rode towards home. Again, it was pretty quiet, I met only a single cyclist and a single runner with a dog. At Energy Park an emergency vehicle was coming the other way on the Transitway, but there were no sirens or lights, they may have just been going to dinner. I was happy to see the Bike Path sign north from Energy Park Drive. Maybe I wasn't such a scofflaw after all. This is the view at the top of the bridge when it arcs north. The State Fairgrounds are in the distance. 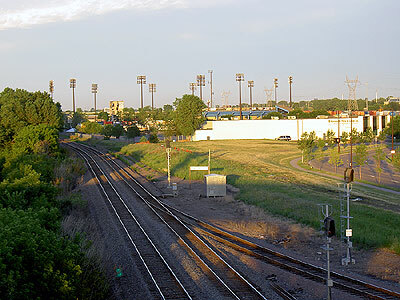 Looking more due east, you see the light poles of Midway Stadium, home of the Saint Paul Saints, as well as some of the railways this transitway deals so elegantly with. Back at the north end, at Como, I turned for home. Another cyclist was just heading up the Transitway. Maybe this thing is common knowledge to others, but to me it was a revelation. 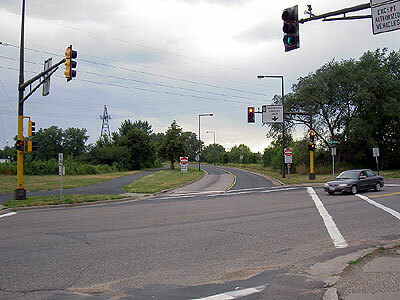 It's not marked as a bike route on the Twin Cities Bike Map so it hadn't occurred to me to try it; I'm not so much a scofflaw that I'd ever tried it in a car, not that there's lots of cops out staking out the Transitway for unauthorized vehicles. At the moment, with Como Avenue severely torn up over by Manning's this makes a great alternative for riding to Minneapolis or the University. And I rode on home, my blinky light flashing away on my seatpost. I hate to mention this, but it seems to me that the days are getting shorter, that my evening rambles are starting to hint at an overlap with light levels where it seems prudent to turn on a taillight. In the end, I rode about 22 miles at roughly 11 miles per hour, which seems to be my average whenever I do bicycle-based photography. With the exception of a few widely-scattered raindrops as the sun came out, it never really did rain and I hauled around my poncho and helmet cover for no reason. Awesome photos. I'd lived in that area for a decade or so and missed some of those details! About a year ago I used that transitway, too, but later read that it wasn't allowed. I'm glad they've removed that restriction; there are so few north-south connectors in that area! Actually, I use Presta valves as well and don't carry an adapter. Maybe I'll start. 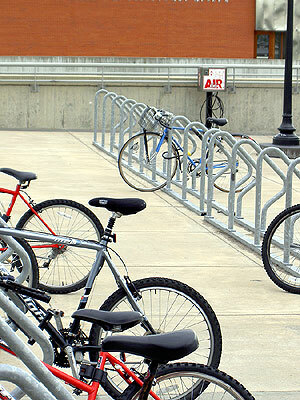 I tried to find any reference to either allowing or prohibiting bicycles on the Transitway. I couldn't find anything either way in the current University publications or on the web. The photo of the sign towards the end of my post clearly marks it for bikes northbound from Energy Park but there's nothing marked at the Como Avenue end southbound, which is why I felt so illicit when I first set off. And, now that I think about it, I didn't actually have to use that pump since I carry one. I just used it because I knew it was right there, on my way.